Bad Bunny performed at El Paso County Coliseum on Friday, March 23. 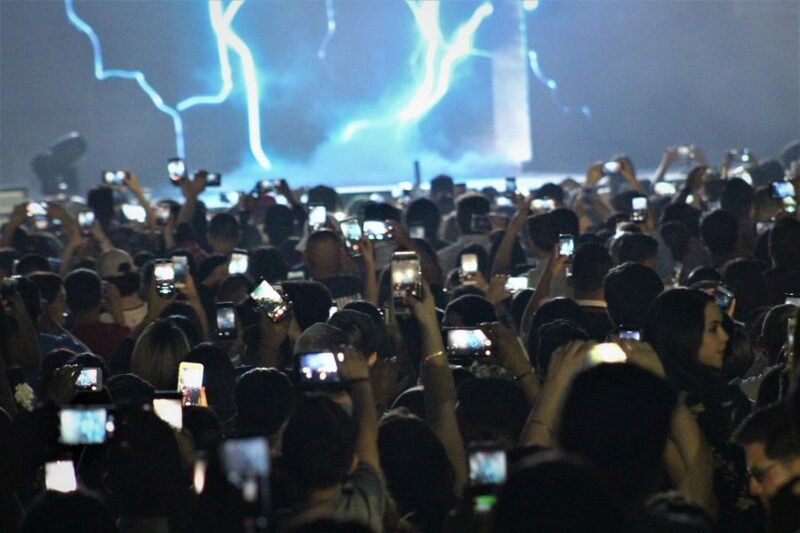 Bad Bunny fans gathered at the El Paso County Coliseum to watch the Puerto Rican rapper perform, marking his second show in less than four months, on Friday, March 23, 2018. The venue vibrated with screams as a countdown was displayed on the screens, alerting fans that it was only five more minutes until the Latin trap star made his appearance on stage. Before you knew it, every seat was full and the lights shut off, as the show officially started. Black and white images of the self-proclaimed “Conejo Malo” flying in private jets and working in the studio filled the screens. Throughout the event, he made it a point to say thank you to his supporters for making his “La Nueva Religion Tour” possible. Relating to all the Latinos in the house, he ignited a roar of cheers by proclaiming his Latin pride. “¡El que se la sepa que la cante conmigo!” Bad Bunny said, making it known that he wanted the crowd to sing along; and so, they did. From recognizable cartoon characters like Homer Simpson to original designs of bright paint splatters, the visuals on the screens were colorful and trippy all through the night. It was reminiscent of a rave, but still had a unique twist as snippets of Bad Bunny’s music videos were displayed. Toward the end of the show, he also expressed his thanks to his team. Without them, the concert wouldn’t have happened and gone as smoothly as it did. He ended the night by calling out all the single ladies and singing songs like his hit with Becky G “Mayores” and other hit singles like “Solita”. The lights went off once again, signaling that the concert had finished. However, the crowd begged for more. Before becoming Bad Bunny, Benito Antonio Martínez Ocasio was a regular guy, working hard in the pursuit of his musical dreams. Now, he’s made them come true, and he left the crowd on Friday night after an encore where he sang “Chambea,” fulfilling the crowds’ desires to hear one more song and paying an homage to his past.